It’s getting colder and wetter, darkness comes earlier and you might have already seen some frost in the mornings. Apparently, this means it’s the perfect time for Krakow to revamp and expand its public bicycle share system. In fact, Krakow was the very first Polish city to start such a system. In 2008, the BikeOne scheme was rolled out with 12 stations and some 100 bicycles (note: long before Boris Bikes in London or Citi Bikes in New York). Unfortunately, it was also the first Polish city to have a public bike system collapse and shut down. This was partially due to a very complicated and strict Polish procurement law. The contract with BikeOne expired after three years. The troubles that followed made the municipality think of operating the bike share by themselves, rather than through a contractor. Now, instead of BikeOne or the unfortunate RoweRes, who took over the system for a few months, we have the KMK Bike scheme with an official 13 docking stations. That’s not very impressive: a similar bike share in Wrocław operates 32 stations, and Veturilo in Warsaw has 128 stations and 2,000 bicycles. In Warsaw, there are more than 10,000 rentals daily, in Wrocław more than a thousand. Krakow is lagging far behind. “Five years ago, when BikeOne started, Krakow was the first city with a public bicycle system in Poland. Today, KMK Bike is almost an exact copy of the system from five years ago. We have lost a chance to develop a public bicycle scheme – Krakow now has one of the smallest systems in Poland,” said Jakub Stępak, a cycling activist with the Krakow Miastem Rowerow advocacy group. And he is not impressed with the proposed expansion: “It’s good news, but I would be happier if there were 150 new stations, not just 15”. And even if the expansion finally takes place, it will not be before KMK Bike closes for the winter. On a more positive note, KMK Bike has announced that it will accept the Karta Miejska smart card and bank cards, making it much easier to register with and use the system. 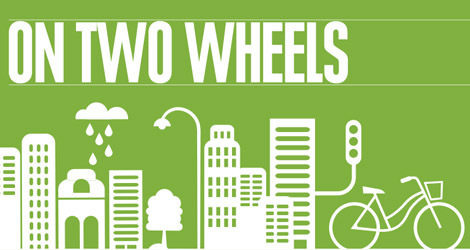 It will also fully integrate the bike share scheme with urban public transport. Today, you must register at the www.kmkbike.pl website. So what about those of us who will be using our own bikes into the autumn? Be careful, because autumn cycling can have many pitfalls. Early in the morning, road surfaces may be icy and slippery. Similarly, those beautiful red, yellow and orange leaves lying in your path can be treacherous. Slow down, don’t brake on them and avoid cornering. Cycling on colder days means you should wear gloves. It’s unbelievable how fast your hands can chill to the bone. The other problem is rain. Krakow Miastem Rowerow recently staged a media event showing journalists a range of very practical rain capes (ponchos), although these are hard to find in Poland. They are very efficient and the yellow ones ensure you are visible in gloomy weather. I bought mine in Amsterdam and have used it for more than 12 years, never getting soaked above knees (to avoid getting soaked below, I advise a pair of overshoes or, even better, gaiters). You will also need your lights earlier. A bicycle must have a red reflector visible from the rear and, at night, in a tunnel or heavy rain or fog, a white or yellow front light and a red rear light. All these must be visible from 150 metres and may be the flashing kind. Enjoy the season, and don’t forget that the real fun begins with first snow. 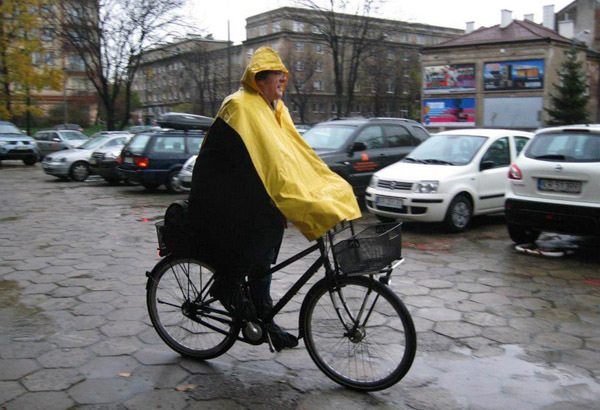 bike poncho import to poland ..
krakow is one of the most beautiful cities in the world. they should think about new technologies that are not so imposing as velib.